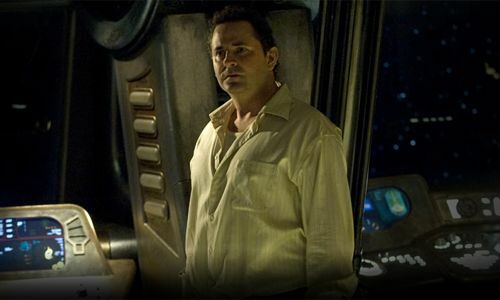 Cultural Wormhole: Stargate Universe - "Aftermath"
Dr. Franklin (Mark Burgess) reappears to offer Dr. Rush some advice. When is Dr. Rush finally going to learn that keeping secrets is going to continue to make things worse for him and for those aboard Destiny. Even when one of his poor decisions results in the death of recurring character, he finds a way to rationalize his choice. He's holding on to as much information about the operation of Destiny as long as possible. This way he has some form of power over Col. Young. Rush even was able to unlock and power up the ship's bridge. But at what cost? Luckily, Destiny isn't going to make it easy for him. It would seem that Rush's experience in the control chair has resulted in visions of his late wife, as well as Dr. Franklin, who disappeared after sitting in the chair himself. Mrs. Rush plays the part of conscience while Franklin is more of a technical advisor. Both never give Rush any answers that he wouldn't have found himself. Rather they may just be manifestations of his own subconscious. While I was sad to see Riley go, his scenes with T.J. were useful in building on the out of body experience she had during the season premiere. She still has no idea what happened, but she seems to take comfort that her dead child is there and is being looked after. I have a feeling that once we revisit Caine's planet, Riley will be there as well. Having Young be the one to finally put Riley out of his misery is certainly going to effect the colonel. Also, we've had two episodes in a row that have ended with Young drinking his grief away. I can't help but wonder if this is going to effect him and his decisions down the road. I found the result of stranding some Lucian Alliance members on the planet, while keeping a few aboard a bit unnecessary. I can understand the strain on the resources and the willingness of some to cooperate are interesting ideas to explore, but keeping some and leaving others seemed like a waste. The writers could have easily just had the Lucians that they wanted to keep around be the only ones left after Young retook the ship. Still, I like the three of the few that got to stick around and I can see how they will interact with the rest of the crew very differently. 'Stargate Universe' continues to be entertaining and intriguing at the same time. The character work continues to be solid. If the ending of this episode is any indication, I certainly hope Rush learns to steer the ship soon. Caprica - "Things We Lock Away"
Rubicon - "You Never Can Win"
Mad Men - "Blowing Smoke"
Rubicon - "A Good Day's Work"
Mad Men - "Chinese Wall"